A friend tagged me this in Facebook, and I thought this is worth sharing. For one, the social relevance it promotes by keeping water clean to be safe for everyone. And two, my blog needs content. Need I say more? Lol. You see, I'm an off-and-on blogger. My blog really needs some serious pampering, my Alexa ranking is now down to 1.4M, oh the horror. My best ever Alexa ranking is 169,279 and this happened when I frequently write articles. Gosh, I always has the tendency to go off-topic when I'm writing - the drama king in me, haha. Now, on to topic. For sure you know, how serious our problem about water pollution? And this phenomenon is not only in the Philippines but in every country of the world. So in celebration of "World Water Day" that would be happening on the 22-Mar-2013 and "Philippine Water Week" starting March 18 to 22, with a theme "Water Cooperation". The Environment Management Bureau of Department of Energy and Natural Resources (EMB-DENR) have launched a Facebook Photo Contest entitled, "Kontribusyon Ko Para sa Malinis na Tubig". So, how about a picture of you, soaked with mud, looking like a mad and trying to remove all that thrash and garbage at a clogged canal. Oh that would be awesome and dramatic, I say. The contest is open to facebook users who are residents of and are in Metro Manila. Contestants must upload photos of them while doing something to help save/protect/conserve water. The photo must reflect the person’s contribution for cleaner waters (ex. Participating in coastal clean ups, cleaning esteros, reusing water, using pail and dipper when bathing). Only one photo entry is allowed per contestant. Photo entry must include the contestant’s full name and institution, if applicable (school/office/organization). Photos must be uploaded on the EMB-EEID facebook page. Submitter may also opt to just tag the EMB EEID facebook page. Photos must be captioned as “Kontribusyon Ko Para sa Malinis na Tubig: (State activity here)”. Photos will be judged according to clarity of message, as well as creativity and composition. The best three photos will win PhP5,000.00 each. Additionally, twenty photos will be awarded PhP1,500.00 (tax inclusive). Judges’ decision is final and unappealable. Deadline of submission of photos is on March 1, 2013 (Friday). Winners will be contacted by the EMB-DENR, and will be asked to present an ID for verification, and will be invited to join the awarding ceremonies that will be part of the World Water Day celebration on March 22. Awarding will be held at a venue to be announced later, where the photos will be exhibited. Winning photos will also be compiled and posted as winners on the EMB-EEID facebook page, and may be used in future water-protection related information materials. All winning entries shall become property of EMB-DENR. Employees and hired personnel of EMB-DENR, and their immediate family members, are disqualified from joining the contest. By joining, EMB deems that the photo is of and originally owned by the contestant, and therefore, shall not be held liable for any untoward case or incident that may happen. 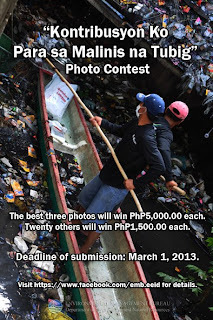 Best three photos to reflect the theme win Php 5,000 each while 20 others will receive Php 1,500. Submission is until March 1, 2013. So hurry up and get that camera ready and off you go to Pasig. There's a lot of cleaning to do.